We heard news over the holiday that QFC will soon be closing its Grant Park market, located at NE 33rd and Hancock. The imminent closure has sparked comments and memories here on AH and elsewhere, not about QFC (sorry about that, QFC), but about Kienow’s Market, which is what that place was for most of its life, from the mid 1930s until 1999 when this Kienow’s closed and the store became a QFC. For the record, we will miss the convenience of being able to slip into QFC for a few quick items on the way home. Beyond living memory? Here’s the original store that stood at the southwest corner of 33rd and Hancock, pictured in 1939. The store also had a dwelling unit on the south end. This building was demolished in the mid 1940s when the full-block version of the store that most people remember was built. From The Oregonian, May 26, 1939. You couldn’t grow up in this part of northeast Portland in the mid 20th Century and not have a Kienow’s memory, and AH readers have been sending us theirs, which we wanted to share here. We also wanted to reach back a bit before living memory to understand the earliest history of groceries at that corner. We’ll do this chronologically, taking us back to 1912 when a small store attached to a home existed at the southwest corner of NE 33rd and Hancock. Building permits suggest that first store + house (you can see its grainy photo above from the late 1930s) was actually an old repurposed school building from 33rd and Tillamook (the first Fernwood School) that was moved to the Hancock corner, where a basement was dug, a chimney built, and a storefront stuck on the front. At that time, the property was owned by Carl Abendroth and later by his brother Adolph and was known both as Abendroth’s and as Fernwood Grocery, after the school building we know today across the street was built in 1911. 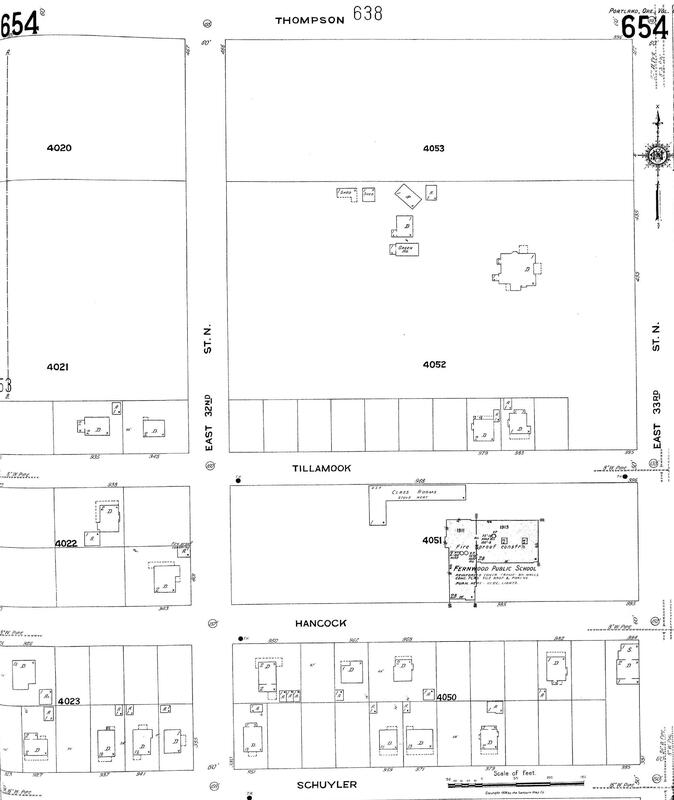 In this detail from the 1924 Sanborn Fire Insurance map, we can see a relatively small Fernwood School occupying the full block between Tillamook (which used to go through to 32nd) and Hancock. The precursor building to Kienows is there in the bottom right hand corner (see the “S” next to the “D,” that’s shop and dwelling). It’s interesting to see how little of the neighborhood to the north is built, and check out the greenhouse, sheds and old farm house in the fields to the north. Read more about Sanborn maps here. Aerial photos from 1936 and 1939 show a vacant lot south of the original building that looks like it’s been planted in rows. A garden? Here it is in 1940, still a shop and house at the corner of NE 33rd and Hancock and a path through the vacant lot to the south, not yet the full-block store that became the Kienow’s that everyone remembers. Detail of aerial photo from 1940. Click to enlarge. Aerial photo courtesy of University of Oregon Map & Aerial Photo Library. 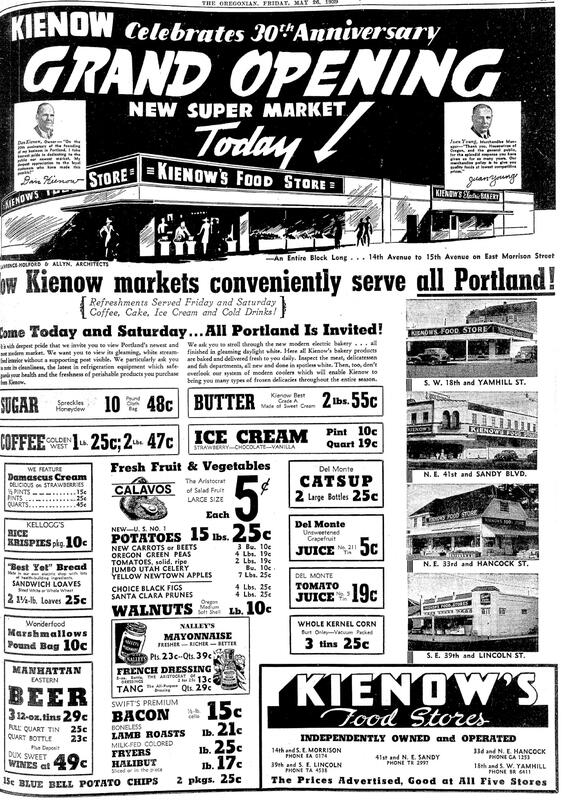 Kienow’s was on the leading edge of transforming Portland’s grocery market from the more than 700 mom and pop grocery stores to a much smaller number of midsize and big stores. Fred Meyer and Safeway were also blowing up the small grocery world during these years. But it seemed that Kienow’s was just a bit more down home than its two biggest competitors. Readers of Beverly Cleary’s Beezus, Ramona, Henry and Ribsy children’s books will also recognize Kienow’s as the grocery store seen out the window of the nearby school. Read more about the local geography of Cleary’s imagination. From long-time resident John Hamnett: A few things that I remember about the old Kienow’s store was the meat section and the box bin. There were mirrors on the back of the counter where the meat was displayed. There was a button you could press for the butcher. He would slide open a section of the mirrors to talk to the customers. The box bin was next to the check out registers. Rather than paper bags, the groceries were put into boxes from items that were stocked in the store. The registers were the kind with the rows of numbered keys. The clerk rang up each item one by one and punched in the amount that was stamped on each item. I always marveled at how they could hit the correct keys without even looking at them. It was not like the scanner we have now. Kienow’s had a turnstile at the entrance. You had to leave the store by going out through a check stand and a separate door. As I recall, it didn’t last long before they took it out. There was a 5 & 10 cent store on the north end of the grocery store. I think it was called Lou’s, but I may be mistaken. It was a separate store, but it also had an opening into the grocery store. After school, kids would go over there a buy candy. My favorite was a Tootsie Pop for 2 cents or bubble gum for a penny. In later years, the Bohemian Bakery might have been in this space. In the early days of the new full-block Kienow’s, there was also a food counter / diner inside, maybe the precursor to what John mentions as Lou’s. In the late 1940s it was known as Smitty’s Fountain Lunch, and in the 1950s it was the Penguin Café (which relocated here after leaving the Sellwood area). All three businesses sponsored bowling teams (a very popular activity at the time) and searches in the newspaper for any of those names–Kienow’s, Smitty’s or Penguin Cafe–will lead you to a bowling score, not an important factoid about the business. From Steve Goodman: I remember the original Kienow’s building. It had one row of parking in front, a larger parking lot in back. And the Bohemian Bakery counter that was always busy. In front was a mechanical horse, with leather fringes on the saddle, that I usually tried to beg my parents for a dime to ride up and down. A couple of gumball machines that took a penny were inside, as was an old Coke vending machine where you could see the bottles thru the window. I think a dime for a bottle of Coke. 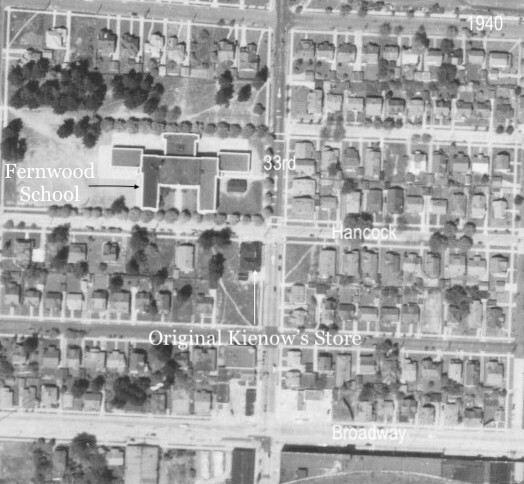 A major fire struck Kienow’s at noon on March 7, 1952, causing $75,000 in damage, destroying stockrooms filled with cans, and bringing an end to the school day for the children at Fernwood School across the street who were let out to watch the spectacle. What do you remember about Kienow’s? We wonder what will happen next with that property. Given the growth of condos and apartments at the intersection to the south, we wonder if the entire two blocks that make up the former Kienow’s (QFC) and the long-vacant Jackson’s convenience store will soon transition to housing. There was also a Kienows on the SW corner of 21st and Broadway. I recall the sawdust on the floor behind the meat counter. My mom and I would go together for her shopping. Among other things, she bought raw kidney for our cat. Ugh!!. A bit of area trivia…..Rusty Nails (Jim Allen – Rusty The Clown) lived on that block — Schuyler and 32nd. 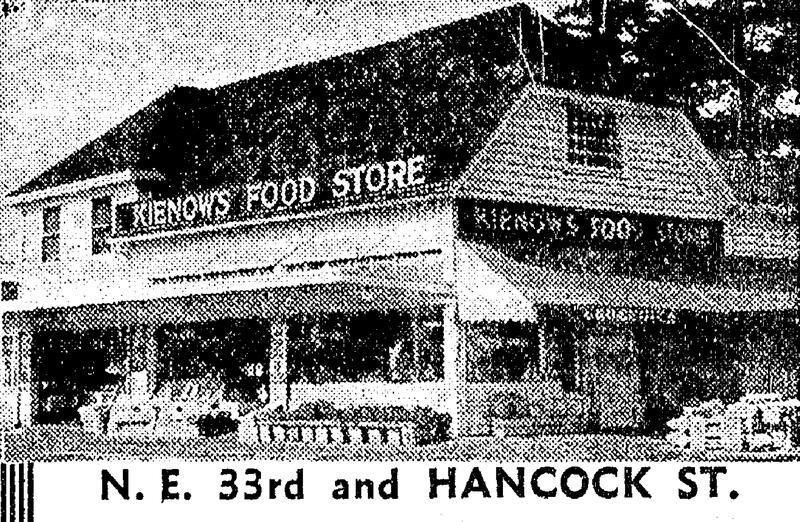 I used to go grocery shopping with Mom in the ’60s at the NE 33rd Kienow’s. Maybe visited the Bohemian Bakery for maple bars. In the mid 70s I was a boxboy in the newest/last version of the store. Juan Young, in the ad above, was president of the chain and visited the store on Sundays. Friendly Joe Reidy was the manager, he ran a great store to work or shop in. Lucky I am to have spent time associated with the friendliest stores in town. QFC is a continuation to me. I was a boxboy there in 1976 and worked for Joe as well. My father was the meat department manager for 30 years at the Kienows on 55th and E Burnside. Many fond memories. My son was a recipient of $10,000 in scholarship grants from the Juan Young Scholarship Fund which was set up for descendants of former employees and is still in effect today. Even though it’s not Kienows anymore this particular QFC is still the closest thing to what Kienows represented to the community. It will be a sad day for many to see them close. My memory doesn’t go back as far as many of these. We moved to the area in 1955. Although we lived north of Knott Street and we went to Alameda Elementary School, Kienow’s was my mother’s ‘go to’ store. Mother still shopped some at Fred Meyer (Hollywood) and Safeway (24th & Fremont). But the Kienow;s store had the Bohemian (Ann Palmer?) Bakery. This is where ALL of our birthday cakes and cakes & pies for special occasions were purchased. I remember that the fresh Thanksgiving turkey came from Kienow’s. My Father was a bit disgruntled because he wanted to buy the turkey elsewhere. But mother wouldn’t hear of it. She wanted a fresh Kienow’s turkey! And she got it. Every year. I’ve really enjoyed the recollections, and Doug, your historical digging is superb, as usual. What happened after 1952, however, I’m still not clear about. Was the current building (QFC) the same building as Kienow’s? Was the fire damaged building (with one row of parking in front) torn down and rebuilt, and if so, did QFC do that when they purchased the property? Thanks in advance for any clues. EDIT: I found a January 17, 2000 Oregonian article that states “QFC, a subsidiary of Fred Meyer Inc., took over the former Kienow’s grocery store following the sale of Kienow’s assets last year. The company is wrapping up a $3.2 million remodeling project that will expand it and will open later this winter.” It sounds to me, then, that Kienow’s built a new store west of the footprint of the first stores, with all parking in front. Anyone know when that happened?